Last month, we discussed the fun geeks were having with the Federal Reserve Bank of Atlanta’s GDPNow. It’s a fun little tool designed to give an early read of where U.S. gross domestic product is headed. Some detractors had pointed out that it often was too negative. Enter the Federal Reserve Bank of New York; it too got into the nowcasting game, with a model that seemed more upbeat than GDPNow. 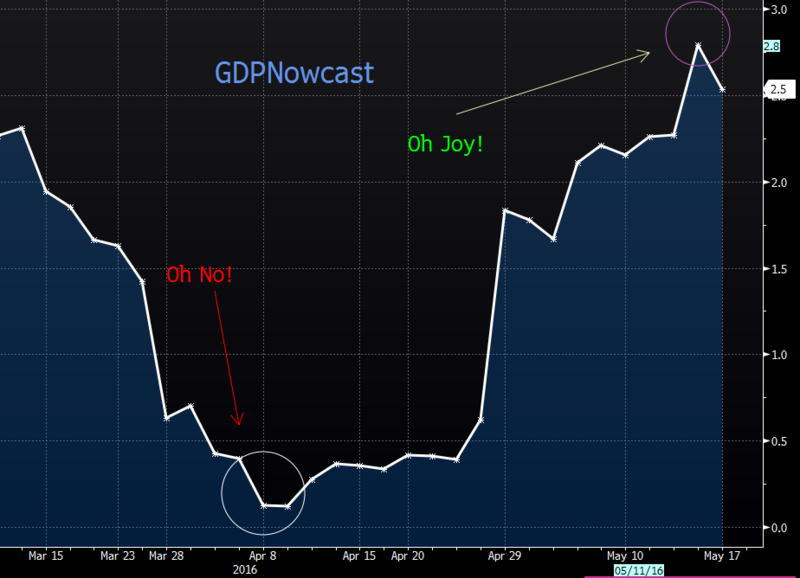 I was reminded of this recently courtesy of my Bloomberg colleague Joe Weisenthal, who tweeted that he “hadn’t seen any mentions of the Atlanta Fed’s GDPNowcast in awhile.” The reason being that the selection bias of the economic bears was such that they only showed whatever cherry picked data supported their preexisting views. Similarly, economic bulls have the NewYork Fed’s Nowcast to support their own preconceived biases. Don’t say you weren’t warned: I expressed “my doubts about all of it” just last month. Given that we now have a bullish and bearish model, expect bias and selective perception to rule the day. Trying to depict the entire economy in real time — before the quarter has even played out — is an exercise in futility. Any model by definition must make assumptions, choices and have preferences in order to work its way through the process of assembling multiple sources into something resembling a coherent whole. Even the best models, which purport to be unbiased, must make choices about how data is put together and processed. Some of those choices will end up making any given data series right or wrong for a period of time. That’s the problem with trying to extrapolate short-term noisy data from a weekly or even monthly data series into a full-blown quarterly assessment of the economy; there are simply too many things that will occur during the rest of the quarter that are not given to simple projection based on information collected in the early parts of the quarter. But don’t let my criticisms about forecasting (see this, this, this, this,this, this, this, and this) or a Fed Bank’s attempts at nowcasting dissuade anyone from trying. An honest and intelligent attempt to model economic factors is an exercise that has the potential to advance the way we think about measuring the economy. Eventually, it could even lead to changes that might improve Bureau of Economic Analysis and Labor Department data compilation. I’ve been a forecasting skeptic for a while. I was influenced by, among others, William A. Sherden and his 1999 book, “The Fortune Sellers: The Big Business of Buying and Selling Predictions,” which chronicled just how poorly those in the business of making forecasts — whether economists or meteorologists — fared. The University of Pennsylvania’s Phillip Tetlock was another. His book, “Expert Political Judgment: How Good Is It? How Can We Know?,”put some quantitative flesh on the narrative bones. It showed just how accurate screen writer William Goldman was when he said said “Nobody knows anything.” (This has since become one of my favorite quotes). But all is not lost in trying to make intelligent probabilistic assessments about the future. Tetlock’s newest book “Superforecasting: The Art and Science of Prediction” is a how-to guide for making better predictions. It isn’t that we are going to become Delphic oracles anytime in the future — that’s my prediction! — but that we can at least learn how to make better assessments based on data and probability, as opposed to reading entrails or making unsupported guesses. Where does all of this hyperventilating about nowcasts and predictions leave us? Although we all more or less stink at predicting the future, we can at least improve our batting averages by taking a more intelligent approach. Perhaps all of these exercises in nowcasting will help make the official GDP models from the Bureau of Economic Analysissomewhat better. If that happens, we can give credit where it’s due — to the regional Feds. Originally: The End Is Nigh! Oops. That Was Only a Forecast. April 14, 2016 Fed Battle of ForeNowcasting!